The Los Angeles, Detroit and Chicago auto shows are over, and now it’s time for the 33rd edition of the DFW Auto Show to cruise into the spotlight. Up and running Feb. 19-23, the DFW Auto Show comprises more than a half-million square feet of new cars, trucks and SUVs at the Dallas Convention Center. About 40 manufacturers will be represented, from Kia to Chrysler, from MINI to Mercedes-Benz and from Lexus to Land Rover. “The DFW Auto Show is the ideal opportunity for consumers to compare styling and pricing of every major make under one roof in just a few hours,” says the auto show website. Five of the six halls at the Dallas Convention Center will be used for the show, increasing exhibit space this year to 650,000 square feet. Two Ride & Drive events are scheduled versus one in past years. And the Aftermarket Area is twice the size it was in 2013. “Last year’s Show was one of the most successful in our 30-plus-year history, so there is a lot of pressure to produce yet another noteworthy event,” said Don Herring, Jr., DFW Auto Show chairman. More than 700 models will be on display at the event, including 2015 Acura TLX Prototype; Audi A3 sedan; Cadillac Escalade; Chevrolet Camaro Z-28, Colorado, Silverado, Silverado HD and Tahoe; Chrysler 200; Ford F-150, Mustang and Super Duty; GMC Canyon, Sierra HD and Yukon; Lincoln MKC; Porsche Macan; Subaru WRX STI Launch Edition; and Volvo V60 wagon. The High End area of this year’s DFW Auto Show will spotlight Aston Martin Vanquish Volante, DB9 Coupe and Rapide S; Bentley Flying Spur and GT Speed Convertible; Ferrari 458; McLaren Spider; Maserati Ghibli, Quattroporte and Gran Turismo MC; and Rolls-Royce Wraith. DFW Auto Show visitors also can see the $1.6 million Italian supercar, Pagani Huayra. 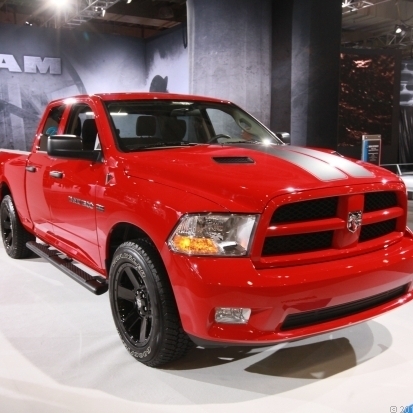 Among the opportunities to test drive vehicles will be the indoor RAM Trucks Ride & Drive, where professional drivers will steer participants through an interactive adventure zone in a 2014 RAM 1500. The track will feature a 13-foot high, 30-yard long, 30-degree iconic RAM Mountain, as well as a 12 x 25-foot section of terrain simulating fallen logs that highlight the vehicle’s ground clearance. In addition, kids will get a chance to drive on the Mini-RAM Kids’ Course. Outside, the annual Ride & Drive event will continue to provide Show attendees with the opportunity to delve further into their new vehicle research by test driving a variety of cars, trucks and SUVS from Chrysler, Jeep, Dodge, RAM and FIAT; Chevrolet, Buick and GMC; Cadillac; Ford; Kia, and Mazda. For a rundown of the manufacturers, see “Who’s at the Show” on the auto show website. Sponsors of the DFW Auto Show include Cars.com for which RoadLoans is a trusted lender.